This is an Original Mixed Media Wall Hanging Sculpture by Victoria Lee Croasdell, an awarded, published and exhibited; multi-disciplined artist, photographer, writer, poet and engineer. She is also a member of MRISAR's R&D Team. 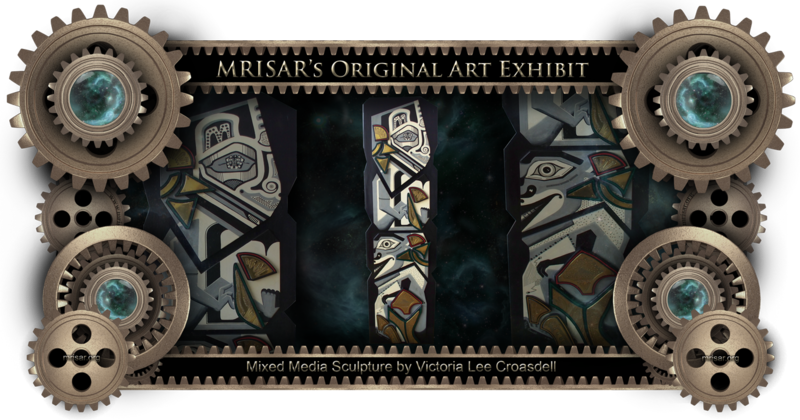 She is the primary designer of all MRISAR graphic headers, exhibit display borders (like the one above), exhibition graphic panels and design details on our robotic and science exhibits. This art piece is several layers deep and is made of a combination of hand etched brass, hand cut M.D.O. pieces, and hand painted with acrylic details. It is based on the art of the Native American Tribes of the North-west. Size 15" wide x 53" high. Created in 1997.